Moving to Maine and becoming a full-time self-employed artist was a big, and some might say risky decision for us. I had worked in accounting for a number of years and even though I liked some aspects of it, I knew it wasn’t for me. Fortunately, in Maine I got off to a good start getting my paintings into several galleries and my work was selling. We were in a happy place when all of a sudden I was presented with a big life changing decision. Mr. Charles Cawley, the CEO of MBNA America Bank N.A., the fast growing credit card company, was buying my paintings for the corporate offices around the country. We met at the grand opening of the Camden, Maine office where I thanked him for his interest in my work. I was nervous to go up to him, wondering if he would have any idea who I was. He was surrounded by people and it looked like he was holding court. As the conversation died down, my wife and I approached him and I introduced myself as Bill Beebe. The first thing he said is “You’re William to me” (which is how I sign my paintings). What a charming way for him to let me know he knew who I was. After painting several commissioned paintings for him, he came to our house and presented me with a big opportunity. 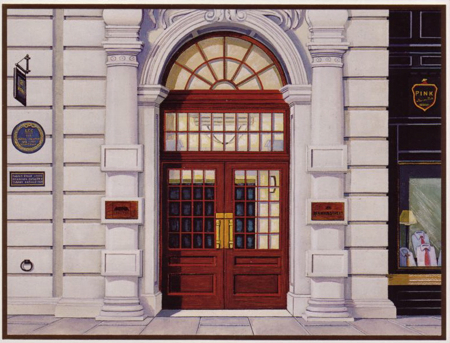 How would I like to become the resident artist for MBNA, painting the office buildings that would be on the covers of the quarterly stockholder reports? I no longer would be my own boss, but I would have a very nice salary and benefits. I would be painting office buildings on a regular basis. I could still work at home in my studio. If I decided to take the job I would be working for a big corporation. It didn’t take me long to make the decision. Maybe it’s the practical side of me. The thought of having my work on the cover of the quarterly reports going out to many thousands of stockholders was beyond my imagination. The thought of a steady paycheck and top notch health care coverage for an artist was too good to be true. The new challenges were exciting. I developed my skills with drafting equipment, using an architect’s elbow drafting arm and grid system to enlarge and produce the under drawings. The majority of the time I would fly to the sites chosen to be on the next cover and photograph the building from various angles, trying to think creatively and envision what might make a good cover. Sometimes as with the new headquarters in Wilmington, DE the office wasn’t complete before I was to paint it, so I would work from the architect’s construction plans and renderings. Here is my painting of the Wilmington headquarters for MBNA. Since the building was under construction while I was painting it, there were a number of changes to the building that affected my painting mid-stream. If one was to x-ray this painting you would find two sets of flags flying! I had to paint over the first set of flags (an advantage of oil paints) and place the new flags in their final location. This process earned me the title of “Evolutionary Painter”. Next are two aerial perspectives I painted of Headquarters. Fortunately, I wasn’t the photographer who had to hang out of the helicopter to take these pictures! Lastly, I thought I would share with you some of the other offices around the world that I painted, to give you some examples of the variety of architectural styles. Putting it all in perspective, now that I have the advantage of hindsight, Yogi Berra’s famous quote comes to mind “When you get to the fork in the road… Take it”. Deciding to work for MBNA turned out to be the right decision at the right time for me. Sometimes leaps of faith require mustering up a little courage, out of which much good can come!